We’d love your help. Let us know what’s wrong with this preview of City of Games by Jeff Deck. Ex-cop Divya Allard finally knows who murdered her fiancée. But first she'll need to locate her missing friend from the Portsmouth PD, Milly, who is accused of manipulating an elderly millionaire. To sort out the truth, Allard must cross dimensions to the City of Games, where everything's a bet and the stakes are senses, memories, emotions — or even life itself. 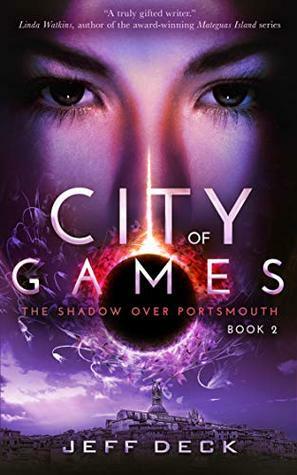 To ask other readers questions about City of Games, please sign up. Yep, it is my book and I'm giving it five stars. Hope you enjoy it as well; I Wager my heart and soul that you will! This book gave me exactly what I wanted after reading the first - a strong otherworldly adventure, greater insight into the mind of the protagonist ex-cop Divya Allard, and a profound sense that this is just the tip of the iceberg. Book 3 is on the horizon. I wonder what type of trouble Divya will get into this time? I wonder how much more she will grow? I wonder what beautiful and terrible worlds lurk just around the corner? Much as the first book, this is another character driven story in the series that just continues to work very well. Part missing person, part sci fi adventure, part good cop, bad cop, badder cop, the book is unique, his style is unique and the series thus far is a wonderful experience to read and enjoy. This is a missing / disappeared friend story with a lot more fantasy aspects (than the previous book), a touch of sci-fi and a little weirdness. Enjoyed the book. Jeff Deck is a fiction ghostwriter and editor who lives in Maine with his wife, Jane, and their silly dog, Burleigh. Deck writes science fiction, fantasy, horror, dark fantasy, and other speculative fiction. Get a FREE book when you subscribe to Deck's e-mail updates. Just go to: www.jeffdeck.com. Deck's new book is the urban fantasy / mystery novel "City of Ports." He is also the author of the sup Jeff Deck is a fiction ghostwriter and editor who lives in Maine with his wife, Jane, and their silly dog, Burleigh. Deck writes science fiction, fantasy, horror, dark fantasy, and other speculative fiction. Deck's new book is the urban fantasy / mystery novel "City of Ports." He is also the author of the supernatural thriller novel "The Pseudo-Chronicles of Mark Huntley" the sci-fi gaming adventure novel "Player Choice," and (with Benjamin D. Herson) the nonfiction book "The Great Typo Hunt: Two Friends Changing the World, One Correction at a Time" (Crown/Random House). Deck is also a fiction ghostwriter/editor who helps other authors tell their stories, and he has contributed content to a couple of video games.